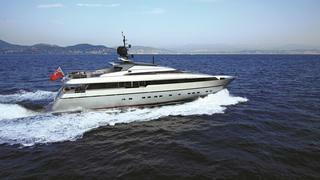 The 38.5 metre Sanlorenzo motor yacht Orion has been sold by Ocean Independence. Built in aluminium to a design by Francesco Paszkowski, Orion is ABS classed and MCA compliant with delivery in 2009. Accommodation is for 10 guests in five cabins consisting of a master suite on the main deck, two double cabins and two twin cabins, all with en suite facilities. Francesco Paszkowski created lavish interior designs, as well as the exterior deck areas, that take a unique twist on traditional yachting aesthetics. The common areas inside Orion were designed to stimulate conversation and sociability. A large lounge area in the saloon features a U-shaped set of settees gathered around a coffee table that lets guests participate in group discussions or pair off for private conversations. Ample deck spaces feature several areas on this yacht for sale with al fresco entertaining and dining and there is an on-demand Kaleidescape audio and visual system throughout. The aft deck has built in upholstered seating, a table and chairs, while the uncluttered sun deck has plenty of seating, tables and sun pads. Notable features of Orion include the four folding balconies on the main deck and two signature gullwing doors into the bridge deck. Twin 2,750hp MTU engines give her a cruising speed of 15 knots, a range of 1,000 nautical miles and she is fitted with Naiad zero speed stabilizers. Orion was asking €8.5 million.